Jeff Roets split his time growing up in Florida and California and later moved to Colorado where he met his wife Cara, in a church Bible study on the Song of Solomon. 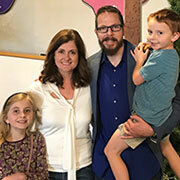 After being called into pastoral ministry, Jeff & Cara moved to Southern California where Jeff attended the Master’s Seminary because of the influence of John MacArthur’s preaching and writing ministry. He received his Masters of Divinity from the Master’s Seminary in 2010. Jeff & Cara have two beautiful children and love dazzling them with the love and grace of Christ. Jeff’s passion is to exalt the person and work of Jesus Christ by praising Him in worship, preaching the Bible by putting Him on display, praying boldly in His Name, and proclaiming His Gospel. Jeff’s ministry is aimed at calling people away from the love of this world and into a satisfying and growing relationship with Jesus Christ. Jeff’s joy is found in teaching the Bible, proclaiming the Gospel, and making disciples for the glory of Christ Jesus.